Yay for three needle bind off! 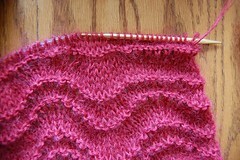 In this blog post, I am going to discuss the three needle bind off. I first heard about this technique when I was at a yarn shop in Philadelphia and I remember how nifty I thought it was. A very kind knitter showed me how to do it and we both marveled at the outcome. 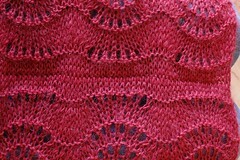 Over the past few days, I have been knitting on two identical pieces of my Feather and Fan Shawl. In my instructions, I will tell you exactly where in the pattern to stop. It is a specific row where I will make you stop, and for symmetrical sake it is mandatory that you follow my instructions as written. Geeeeeez. That sounded like a real strict teacher! See that purl ridge? 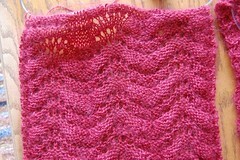 I will have you knit two rows of stockinette stitch after that purl ridge. Don’t worry, I will tell you exactly what row in the pattern that will be. 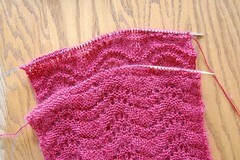 To apply the three needle bind off, the two Right Sides of the pieces, should face each other. So while doing the bind off, the Wrong Side is facing you. Quick side step for the newbie knitter about the terms Right Side and Wrong Side. 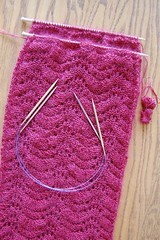 Throw a third needle in the mix to start your three needle bind off. For your third needle, use one that is one size bigger than your working needle! 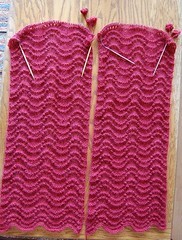 In my pattern, my working needle is US8, so the third needle with which I will bind off, will be US9. Why? 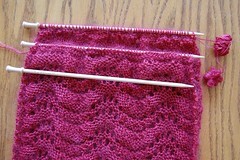 See the three needle bind off is kind off tight, and to relax it a bit, I use one needle size bigger. As you can see in the picture, my pieces are on Addi Turbo needles. I love them because they are quite slick, but I dislike them for casting off! They drive me bonkers when I bind off with them! 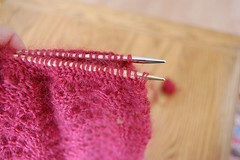 To see how the three needle bind off is done, I am now directing you to the casting off section of Knittinghelp.com. 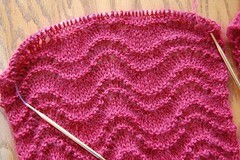 Scroll all the way down until you hit the three needle bind off technique, and see how Amy does it! So neat right? Nice and tidy, just the way I like it! 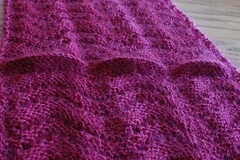 With this shawl I am not going to use pins to block. I love love loooooove my dryer rack and use it all the time. I purchased it at Target. Just go to their laundry section and you will find it. 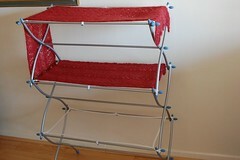 It is called “Michael Graves Design Drying Rack” and it is a great purchase for a knitter that wet blocks a lot! Now I let my piece dry over night and then I will need to take some pictures. 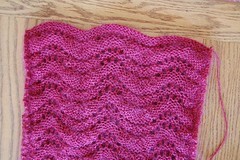 This pattern will be offered for free in my next blog post. I will provide a pdf and I will also provide a picture tutorial. See how much I love you..? Thank you for reading, dear friend, and until the next entry! 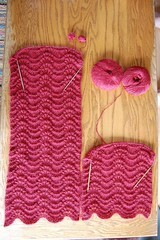 This entry was posted on Thursday, April 1st, 2010 at 7:57 pm and is filed under Knitting. You can follow any responses to this entry through the RSS 2.0 feed. Both comments and pings are currently closed. 5 Responses to Yay for three needle bind off! I’ll be right here waiting for that free pattern! Thank you very much. I do hope you are going to have pictures of you modeling it. Do you ever use a steamer when blocking? I plan to hit Target next week looking for a drying rack. I can’t wait. I’m ready to cast on. 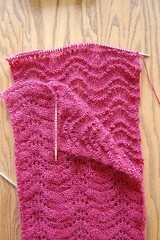 I love three-needle bind-off, too. I’ve used it on the Baby Surprise Jacket and other times that now elude me. How do you fit so much fabulous information in one post?!?!? 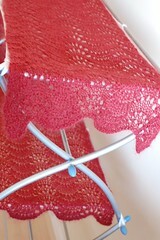 I love the three needle bind-off, I love this pattern, and I’m on my way to Target to buy this drying rack. ❤ ❤ <3!